If you've ever been curious how to clean your house with no chemicals, this is a post for you! I've been on a mission to clean up my families beauty and health routine for some time now and I've learned a lot along the way. So here are some tips to get you started in the right direction. Remember, it just takes a little research online and to be diligent and read labels on the products you buy in-store. Research non-toxic cleaning diy's or products and start cleaning up your routine. You'll feel good about using less chemicals and your lungs with thank you too, when they're no longer breathing in the harsh chemicals. Tip #1 - Dump the toxic shampoo, conditioner, shaving cream, aftershave, perfume, soap, lotion, skincare and make-up! Remember, 90% of what you put on your skin is absorbed into the bloodstream and then finds it's way to your major organs. These harsh chemicals cannot be filtered out of the body because their toxins. The body stores them in the fatty tissues and after some time, cells will begin to mutate what is later into cancer if there is too much toxic build up. Tip #2 - Clean your Bathtub without toxins. Once you've washed your body, let out half of the water. Soap up your washrag, scrubby mitt, or whatever it is you use to wash yourself. Use it to wash out the soap ring around the tub. That same soap ring you have struggled to clean with numerous sprays and powders immediately dissolves when faced with plain old organic soap. Just rub in a circular motion and rinse. Do this every time you take a bath and your tub will stay clean. Tip #3 - Clean your oven without harsh chemicals. To do this, apply a paste of baking soda and water to the surfaces in your oven. Let it sit for 12 hours. Use a wet towel to wipe out the oven the next day. Then spray vinegar on any residue that is left. Finally, wipe with a wet towel. Tip #4 - Clean Floors Naturally. An environmentally friendly way to clean your carpets is Baking soda. You not only can get carpets cleaner by sprinkling baking soda on the carpet and then vacuuming it up, the carpets will smell better, too. You can use plain hot water to wash your carpets, or you can add essential oils or vinegar to the water. For spot cleaning, try spraying with a vinegar solution of 1:1 vinegar to water. Remember that the first thing to do when anything spills on the carpet is to blot, blot blot. After dabbing, stand on that towel to soak up anything that is trapped under the fibers. Then pour a little boiling, hot water on the area and blot it again. Other non-toxic cleaners - As far as other cleaners, use baking soda, lemons, salt, and vinegar as much as you can to replace those toxic chemical cleaners. If you do choose to purchase cleaners, read the labels well - beware of "greenwashing". Just because it says natural, doesn't mean it is. Try Dr. Bronner's Castile Soap! With 25 uses in 1 - it cleans everything from your face, body and hair to your laundry, dishes, floors, bathrooms, the entire kitchen and more. You can also look for some good natural, non-toxic cleaners online or in the store which are non and low toxicity and better for you and your family. Some good ones you can find at Target and Walmart are Seventh Generation, Meyers, Method and Green Works. 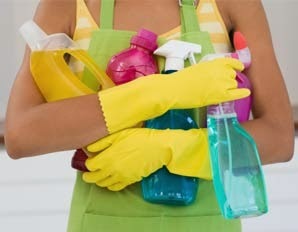 You can also purchase healthier cleaning products at Honest.com, Amazon.com and Vitacost. Now that you've cleaned up your cleaning routine and thrown out the toxic cleaning products, it's time to clean their residue out of your body. Many chemicals are endocrine disruptors; others erode our health in numerous ways, including gut inflammation that disturbs the proper balance of bacteria so essential to all processes of the body and this causes all kinds of problems in the body. For a complete detox, I recommend Eden Total Cleanse. This will supercharge your body and immunity to completely detox your body and help you burn fat and loose weight fast. Make sure you purchase truly green, non-toxic cleaners for washing dishes and clothes. Not just for the environment - it's also for you and your family. Remember when you use standard cleaning products, you are ingesting harsh chemicals that come in contact with your dishes and your skin will soak in any chemicals that come in contact with your clothes.